Design Landing Page for Money Changers to sign up. Please refer to the description below. Feel free to ask questions. Looking forward to your designs. Inviting Money Changers in Yangon to join MMK Tracker. 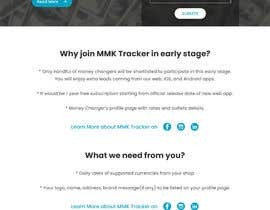 Why join MMK Tracker in early stage? - Only handful of money changers will be shortlisted to participate in this early stage. You will enjoy extra leads coming from our web, iOS, and Android apps. - It would be 1 year free subscription starting from official release date of new web app. - Money Changer's profile page with rates and outlets details. - Your logo, name, address, brand message(if any) to be listed on your profile page. Please feel free to ask any questions. Read more about MMK Tracker on Medium. Ready to sign up? Click here to sign up ([login to view URL]). 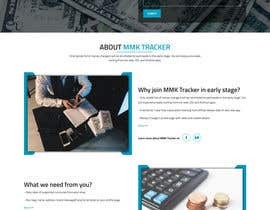 Upcoming MMK Tracker is a platform where all the money changers will be listed in one single website. It allows people to easily find money changers and exchange foreign currencies in their desired locations and rates. there is a spelling mistake in the description. It is not "handle full". It is meant to be "handful". Thanks everyone for joining this contest. Can you link some images, to create devices mockups to improve the landing page? images? what kind of images? Do you need the sign up form on the page, or just a like to the sign up page? page only. i m using google form at the moment. so a button linked to google form will do.